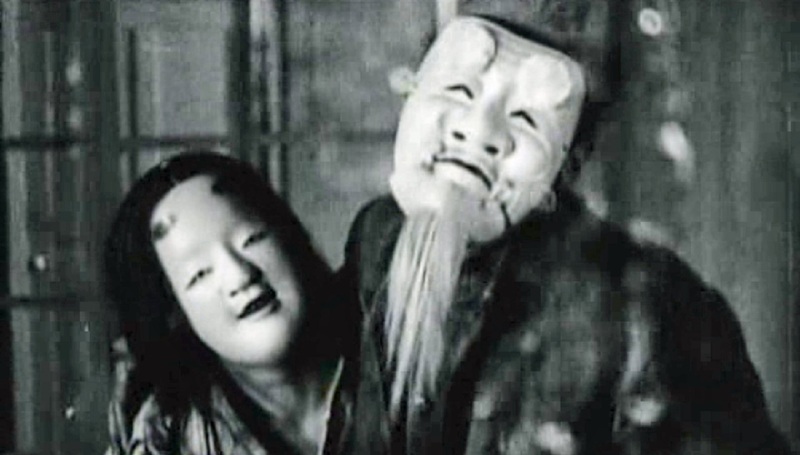 Since the vast majority of Japanese films from the silent era are lost, the existence of a film as unusual and important as A Page of Madness(Kurutta ichipeiji, 1926) is a real stroke of luck. With its bold and striking visual style, its ambiguous (and, on first viewing, perhaps almost incomprehensible) narrative, and its close connections to the most progressive thinking about film of its day, it's no wonder that A Page of Madness has become one of the most discussed and debated of Japanese films. Born in 1896, director Teinosuke Kinugasa had been working in cinema since 1917, initially continuing his previous career as an onnagata (a male playing female roles), then graduating to directing. In 1926, after three years under the great Shozo Makino at Makino Productions, Kinugasa decided to try his hand at an independent production. After buying a movie camera and furnishing a lab in his basement, Kinugasa approached members of the Shinkankaku (new impressionist) literary movement, who were known for their passion for avant-garde cinema, about writing a script about mental illness. His interest in this subject stemmed from a recent visit to a mental hospital and a chance encounter with the reigning emperor Yoshihito, who, rumored to be mentally ill, was generally kept away from the public eye. Yasunari Kawabata, the Shinkankaku group's most celebrated member, worked on a draft of a screenplay, which would undergo considerable revision before and during shooting. (According to film scholar Aaron Gerow, whose book on A Page of Madness is the most authoritative and complete account of the film in English, "there is very little evidence" that Kawabata was deeply involved in the production, and his contribution might most accurately be called an "original story.") The story Kawabata and his collaborators devised concerns a former sailor whose mistreatment of his wife caused her to go mad. Conscience-stricken, the man takes a job as a custodian in the mental hospital where his wife is incarcerated. Their daughter visits the hospital to announce that she is getting married. Despite the threat of inherited mental illness that hangs over this plan, a kind of happy ending is secured for all the major characters. The involvement of Kawabata, the other Shinkankaku collaborators, and well-known actor Masuo Inoue, who agreed to appear in the film for free, sparked interest in Kinugasa's plans, and Shochiku, one of Japan's major studios, offered studio facilities and financial support. 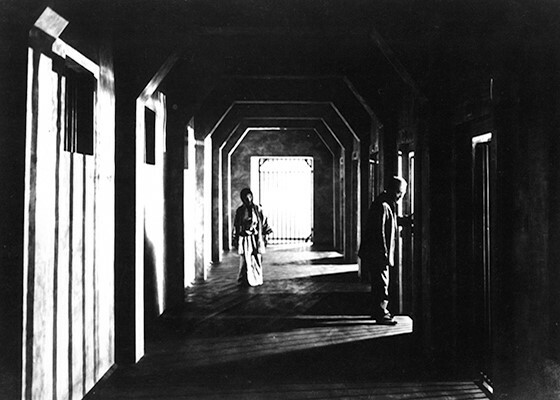 Kinugasa shot the film in May 1926 and had it ready for a preview screening in July. A September opening at two theaters that usually showed foreign films made A Page of Madness, in Gerow's words, "one of the few Japanese works to be treated as the 'equal' of foreign motion pictures in a culture that still looked down on domestic productions." The film instantly became a cause célèbre among critics, one of whom, Akira Iwasaki, declared it "the first filmlike film born in Japan" and claimed "there is no director in Japan who effectively uses the camera as liberally and free of restraint as Kinugasa." Nevertheless, the film was not a success with the public and vanished from theaters after its short release. It was long believed lost, until Kinugasa himself found positive and negative reels of the film in rice cans in his old house in 1971. On first encountering A Page of Madness, with its insane asylum setting, many viewers might think of The Cabinet of Dr. Caligari (1920), but the film bears little stylistic or narrative influence from that Expressionist classic and has closer links to the Impressionist school represented by such directors as Abel Gance and Marcel L'Herbier, whose works were released and much discussed in Japan. Kinugasa himself, in a 1926 magazine poll, cited F. W. Murnau's The Last Laugh (1924) as the best "artistic film" of the year, saying he had seen it five times, and it is likely that the Japanese director was influenced by the German film, notably in the unusual decision to eschew intertitles. Though the absence of intertitles seems to leave great scope to the free interpretation of the viewer as to what exactly is going on during A Page of Madness, it's important to remember that the film was originally shown (and the filmmakers knew it would be shown) accompanied by narration by benshi - professional, often individually highly popular performers who were an inevitable feature of Japanese film exhibition in the silent era.Benshi could fill in gaps in a story, give background information, or elaborate on the thoughts and feelings of characters. Undoubtedly benshi narration helped make A Page of Madness more accessible to its original Japanese viewers, on a story level, than it appears to viewers today. The loss of about a quarter of the original length of the film may have also heightened the avant-garde aspect of the film. Released at about 7,000 feet, or 103 minutes when projected at 18 frames per second, the film exists only in a print running 5,286 feet, or 78 minutes at the same projection speed. Both Gerow and another scholar, Mariann Lewinsky, who has also written a book on the film (Eine verrückte Seite: Stummfilm und filmische Avantgarde in Japan), suspect that Kinugasa shortened the film himself. Using superimpositions, rapid and insistent visual patterns, fantasy sequences, and the visual flamboyance of actors impersonating mad people, A Page of Madness builds an atmosphere of astonishing intensity. The film plays on a continual discordance between subjective and objective reality, although the various layers of the narrative can eventually be discerned by the patient viewer. As Gerow points out, the architecture of the insane asylum and the construction of the narrative both impose a "logic of separation." Though the main characters violate this logic in their attempts to reach one another, their repeated crossings of borders "are significant only to the degree that the borders retain some effectiveness," in Gerow's words. Neither "pro"- nor "anti"-madness, clearly not traditional but also not purely modern, A Page of Madness stands as a rich and ambiguous film and one that demands to be read as a forceful but ambivalent commentary on the potentials of cinema itself. Cast: Masuo Inoue (The custodian), Yoshie Nakagawa (His wife), Ayako Iijima (Their daughter), Hiroshi Nemoto (Her fiancé), Misao Seki (Chief doctor). BW-78m (at 18 frames per second). Aaron Gerow, A Page of Madness: Cinema and Modernity in 1920s Japan. Ann Arbor: Center for Japanese Studies, The University of Michigan, 2008. Yasunari Kawabata, "Page of Madness." In Modanizumu: Modernist Fiction from Japan, 1913-1938, edited by William Jefferson Tyler. Honolulu: University of Hawaii Press, 2008. Jasper Sharp, "A Page of Madness", at Midnight Eye.